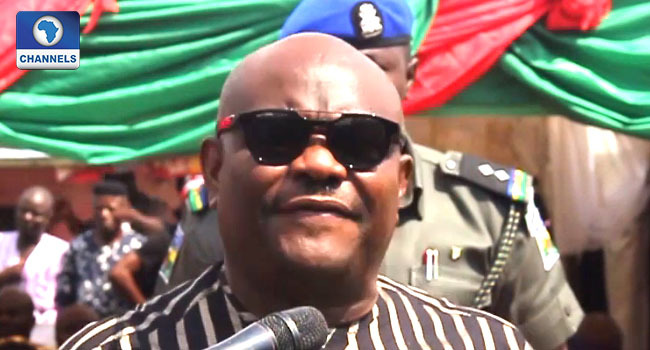 Rivers State Governor Nyesom Wike has placed a bounty on the gunmen who attacked Moku, Ogba Egbema Ndoni Local Government Area of the state on New Year day. The gunmen in the early morning attack killed at least 16 persons leaving the community in shock and fear. The Governor in reaction to the attack promised to reward anyone who can identify the perpetrators with the sum of N200million. Wike said this on Tuesday during a visit to the community, alongside heads of security agencies in the state. He assured the victims of government’s support and also vowed to ensure that the perpetrators are brought to book. One of the victims of the attack, who lost her husband and child in the attack told the Governor that the hoodlums stormed her home on the day of the attack and suddenly started shooting anyone in sight. A combined team of the army, the Police, Department of State Services (DSS) and men of the Nigerian Security and Civil Defense Corp (NSCDC) have since swung into action to ensure arrest the suspects behind the attack.